Dubai, UAE, Tuesday March 5, 2019: His Highness Sheikh Hamdan bin Rashid Al Maktoum, Deputy Ruler of Dubai and UAE Minister of Finance & Industry, today inaugurated Middle East Electricity 2019 – the 44th edition of the region’s leading event for the power industry. Hosted by the UAE Ministry of Energy, Middle East Electricity runs at Dubai World Trade Centre (DWTC) until March 7, bringing together 1,600 industry heavyweights and energetic start-ups from around the globe. With the MENA Power Industry Outlook Report, prepared by Ventures Onsite for MEE, stating the region will require USD152 billion in investment for generation capacity and a further USD108 billion for transmission and distribution (T&D) through 2022, global experts will leverage Middle East Electricity to shine light on the latest power, lighting and energy solutions to feed the region’s ever-rising power demands. 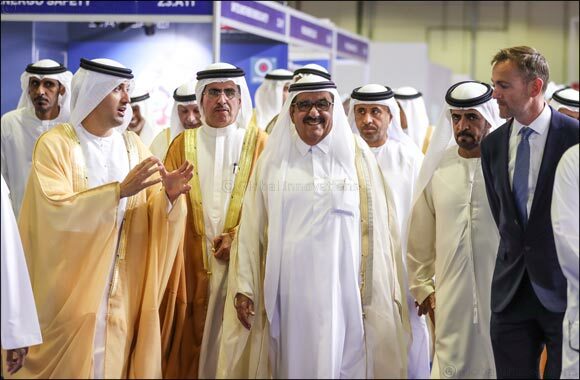 Touring the 15-hall mega show, HH Sheikh Hamdan was accompanied by His Excellency Saeed Mohammed Al Tayer, Vice Chairman of Dubai Supreme Council of Energy, and Managing Director and CEO of Dubai Electricity and Water Authority (DEWA), and His Excellency Helal Saeed Almarri, Director General, Dubai World Trade Centre Authority. HH Sheikh Hamdan was given an overview of the products and services to light the way for a smarter and brighter future for the industry across five key sectors: Power Generation; Transmission & Distribution; Lighting; Solar and Energy Storage and Management. As one of the Gulf region’s true legacy exhibitions, Middle East Electricity 2019 continues to energise the regional industry by providing a tailored platform for industry pioneers to unveil global launches and new-to-market products, specifically geared towards application in the MENA region. Continuing to set the industry trends in 2019, this year’s Middle East Electricity features several new content streams in an expanded knowledge programme which includes the region’s first dedicated IoT Lighting conference. The show will also feature an exclusive interactive screening, on March 7, of the award-winning documentary ‘Point of No Return’, which charts the historic journey of Solar Impulse – the first-ever round-the-world flight powered by solar. The session will include a Q&A with the film’s directors Quinn Kanaly and Noel Dockstader. “This year’s show is shaping up to be the most innovative, interactive and engaging in the event’s history, which now spans more than four decades. The expanded knowledge programme, new content streams and the addition of the ‘Point of No Return’ screening have enhanced the visitor experience, while also ensuring greater accessibility for exhibitors to their target audience,” said Claudia Konieczna, Exhibition Director – Informa Industrial Group, Informa Exhibitions, the shows organiser. Middle East Electricity 2019 is held under the patronage of HH Sheikh Maktoum Bin Mohammed Bin Rashid Al Maktoum, Dubai Deputy Ruler and is hosted by the UAE Ministry of Energy and runs until March 7 at Dubai World Trade Centre (DWTC).